Long life practice (Skt. āyuḥsādhana; Tib. ཚེ་སྒྲུབ་, tsé drup; Wyl. tshe sgrub) is an important aspect of vajrayana practice, employing the skilful means of the secret mantra in order to increase one's own or others' lifespan. Long life practices are often focused on deities specifically associated with longevity, such as Amitayus, the Buddha of Boundless Life, White Tara or Ushnishavijaya (Tib. 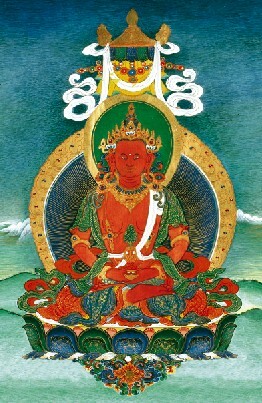 Namgyalma)—known collectively as the 'three deities of long life'—Tsendali, the consort of Amitayus, or Thangtong Gyalpo. Any spiritual practice we do, since it accumulates "merit," will help prolong our lives and bring good health. A good practitioner, through the inspiration and power of his or her practice, comes to feel psychologically, emotionally, and spiritually whole, and this is both the greatest source of healing and the strongest protection against illness. There are also special "long-life practices," which summon the life-energy from the elements and the universe through the power of meditation and visualization. When our energy is weak and unbalanced, these longevity practices strengthen and coordinate it, and this has the effect of extending our lifespan. There are also many other practices for enhancing life. One is to save the lives of animals that are due to be slaughtered, by buying them and setting them free. This practice is popular in Tibet and the Himalayan regions, where, for example, people often go to the fish market to buy fish and then release them. It is based on the natural karmic logic that taking the life of others or harming them will shorten your life, and giving life will lengthen it. All sentient beings have as the ground of their being, the sugatagarbha, due to which they can attain enlightenment. If there were no potential for enlightenment, there would not really be such a special point made about living a longer life. If you are to attain enlightenment, then you require a physical form. It is said that the form of a human being is the best form among the six classes of beings. The ‘boat’ of the human body is very good for crossing the ‘river’ of suffering. This is an important point. But we will not find this boat again and again. So now that we have it, we should not waste our time in laziness and sleep. The vidyadhara should achieve longevity! Of all activities, the first should be long-life practice. And the purpose of this life and the next can be achieved. So it is good to live a long life because we can fully accomplish the purpose of this and future lives. In terms of the methods for prolonging life, the buddhas, who are skilled in means and possess great compassion, have taught many different ways. They have taught both common and supreme methods for extending life. Common methods include ‘extracting the essence’ (chülen) and taking medicinal substances, and methods employing the breath and special yogic exercises. You find a lot about medicine and how to make pills for long-life and so on in the terma teachings. Among the uncommon methods, there is deity visualization, mantra recitation, and dzogrim practice. If the common methods can be combined with supreme, uncommon methods then life will naturally be extended. So when we do long-life practice we bring together the common and uncommon techniques. If, for example, we make long-life pills, which is a common method, then we combine that with the uncommon methods of visualizing the deities and blessing the substances, so that the two levels are combined. Since longevity is so important, there is no tertön who has not revealed methods for long-life practice. Some revealed as many as five or six different practices, some two or three. So there are many long-life sadhanas. Therefore, if you are a practitioner of the Dharma, someone who is putting the teachings into practice, there is great significance to doing long-life practice. If you are not a Dharma practitioner, but just someone caught up in worldly life, then there is not such great purpose to living a long time. Here we are talking from the point of view of a practitioner. These long-life practices bring the two together: common and uncommon. We achieve longevity as the ordinary accomplishment, but in the process, we also achieve the supreme accomplishment. In the best case, we achieve the rainbow body. If not, then by living for eighty or ninety years, we become a good practitioner whose realisation is as vast as space, and who is able to work for his or her own and others’ benefit. Every one of us needs to do long-life practice. And we need to do a practice that combines common and uncommon methods. For this you need an explanation on how to practise. ↑ Sogyal Rinpoche, The Tibetan Book of Living and Dying, page 249. Sogyal Rinpoche, The Tibetan Book of Living and Dying, pages 248-249. This page was last edited on 22 January 2018, at 20:23.